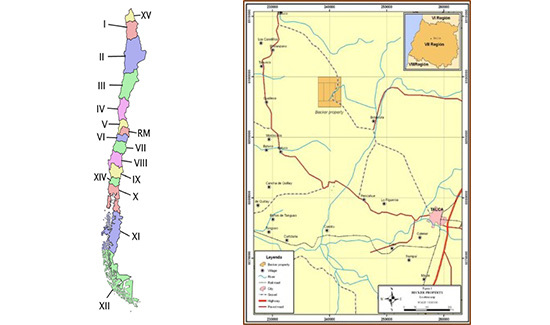 In December 2016, Carlin Resources Pty Ltd (‘Carlin’), now a wholly owned subsidiary of Santana signed a binding agreement to Joint Venture the 2,000 ha Becker property in Region VII in Chile. Santana has the right to earn up to 85% of the project upon satisfying a series of staged cash payments (US$1M over 5 years) and completion of minimum exploration requirements (1,000m drilling – planned to be satisfied by September 2018) + an initial JORC 2012 standard resource estimate (within 5 years) + a feasibility study (within 5 years). Arrangement also provide for a right to benefit to (80%) of a larger (6,000 ha) regional land package surrounding Becker. The Becker Project is located approximately 210 kilometres south of Santiago and 40 kilometres west of Talca in Chile’s Region VII. Access is excellent and provided by a series of public and private roads. The Becker property covers a series of intermediate to low sulphidation epithermal / hydrothermal gold-silver veins within the Chilean Coastal Range, which is geologically comprised of Mesozoic age volcanic arc rocks accreted onto the South American craton. The Becker property has seen little exploration since its initial discovery in 1995 by Arauco Resources Corporation (‘Arauco’). 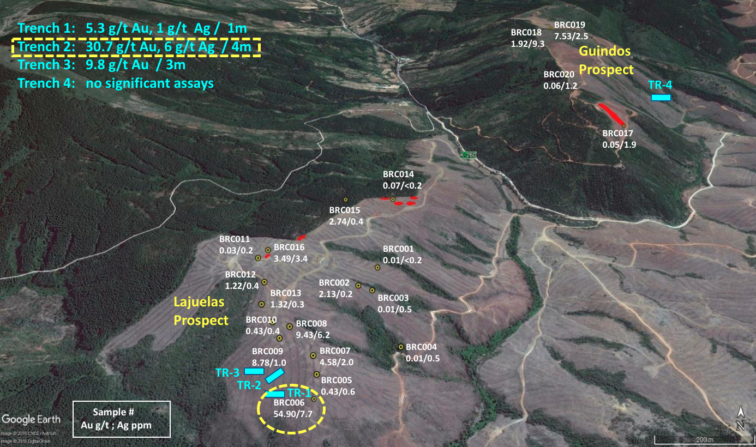 Previous exploration by Arauco identified 11 individual, steeply-dipping, quartz veins varying from 0.5 to 7.5 metres in width occurring over a total strike length of 350 metres in the Lajuelas prospect. Sampling of surface boulders by Arauco returned gold values along the entire Lajuelas trend, with maximum values ranging from 23.5 g/t gold to 79.0 g/t gold. Recent work on the project (early 2017) saw a program of surface rock chip sampling and trenching undertaken. 3.0 metres of 9.8 g/t gold in Trench 3 (TR-3). 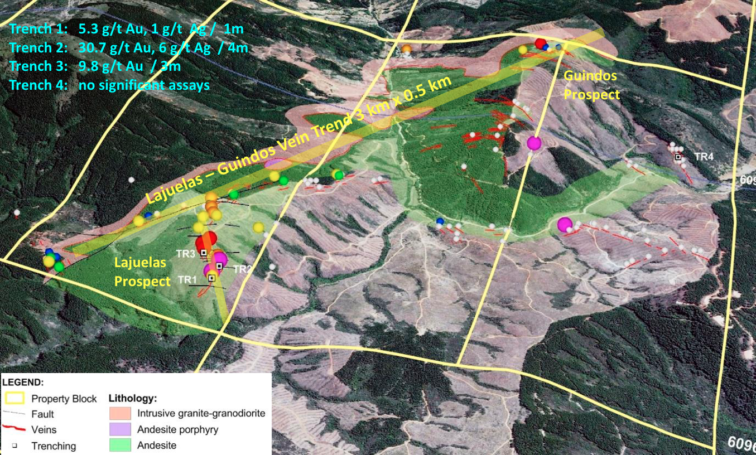 The program confirmed the occurrence of high-grade gold mineralisation within quartz veins of the Lajuelas prospect area and also significant gold mineralisation (7.5g/t Au, 21 g/t Au) within veins of the Guindos prospect area approximately 3 kilometres along strike to the northeast. Both areas are structurally complex with vein trends of various orientations. Surface sampling of quartz veins in the Juanito prospect approximately 2km east of Lajuelas returned a single sample of 19g/t Au. Overall samples from this area indicate base-metal enrichment compared to the other prospects. In July 2017 a geophysics program identified a large alteration zone coincident with the occurrence of gold-bearing quartz veins in the main Lajuelas prospect. Ground geophysics completed included magnetics and gradient IP along northwest-southeast oriented lines at 100 metre and 200 metre spacing between survey lines. Detailed prospecting and surface mapping has also confirmed an extension of the Lajuelas vein system by approximately 300 metres to the south which is consistent with the results of geophysics findings. An initial diamond core drilling program consisting of 1,200m commenced in July 2018. Results are pending.